Found this gem among my searches for pencil marks; I was left in such awe over how considerate she is with her use of marks. They’re so delicate in some areas and in other parts of the image, they’re rough. While this is the case, this may be due to what the image in the painting/drawing could be? or what I would like to think, is that she’s using the marks as a way to communicate the circumstances with in the picture. Here’s an example of one of her drawings to the right, there appears to be at least three people occupying the image. One of them looks quite dominant and the other, submissive? this is quite hard to make out, but there’s tension approaching between them. The colours add a very, fine hint in to what mood could be being portrayed. Other than that, her paintings leave me very intrigued to know what they could be about. There’s another one, which left me pondering what’s going on. 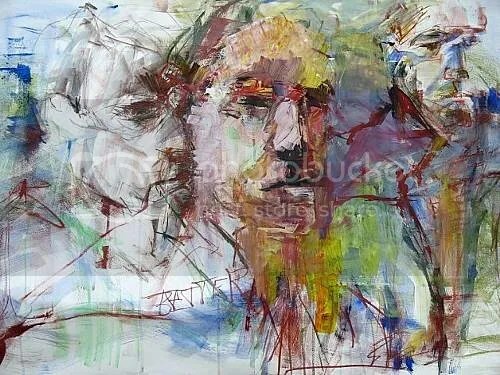 While the artist has tagged the following with ‘woman’, ’emotion’, ‘society’ and ‘struggle’. There’s quite a struggle, indeed. This woman here struggling to find out what’s going on in this drawing. Speaking on terms of this, it’s called ‘Die Schlaufe’ which Google has translated this as ‘The loop’.